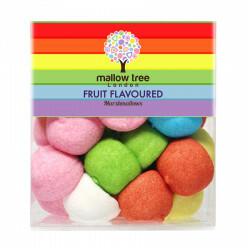 These "Mallow Balls" candies with different flavours will bring you colours at your daily life ! This assortment of multicolored "Mallow Balls" candies will bring colour to your everyday life, greed for your events and birthdays! This box contains marshmallows covered with colored sugar for a beautiful rainbow set with different flavours. The English company Mallow Tree offers a wide range of marshmallows with attractive shapes and yummy colours, for the pleasure of the eyes... and of the taste buds! For Allergens: may contain traces of nuts, peanut, wheat, milk and soy.